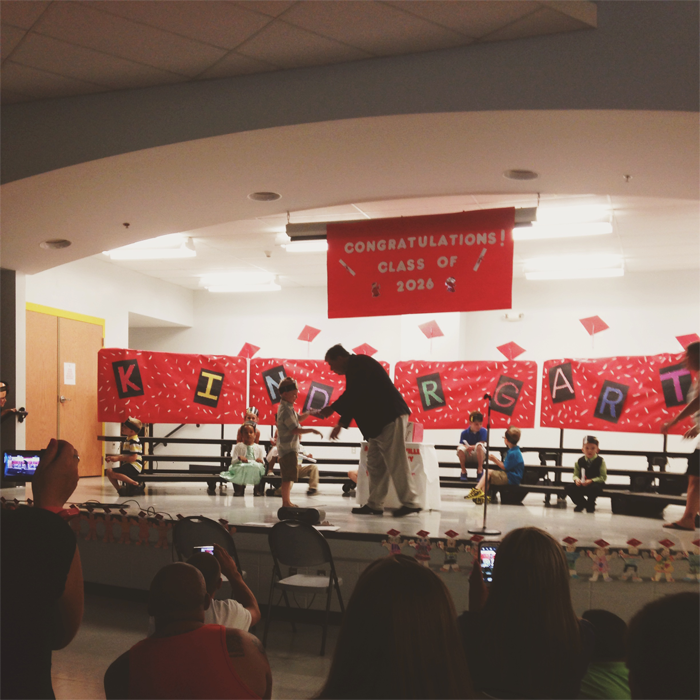 My sweet boy graduated kindergarten last night. I couldn't be more proud of who he is and how far he has come. In many ways, he's a different boy than I imagined him to be when he was a long haired, orange-nosed, toddler waddling around. He challenges me, in more ways than I can write out, and makes me want to be a better mom. This was such a huge year of growth for him. What is it about the pledge of allegiance that makes me lose my marbles? I seriously cannot handle 25 kindergarteners saying that. It's too much. And then Brody's sweet teachers had them sing this song, which was rude of them, cause there was not a dry female eye in the place. It's hard to wrap my brain around this guy being six, and heading off to first grade in the fall. Can you even handle class of 2026? Someone hold me. As much as I miss little things about him being younger I am mostly excited to see all the Lord has in store for him. I'm thankful for the grace he gives me, for his inquisitive little brain, his sweet spirit, and determination. Now we are on to squeeze every last ounce of goodness out of this summer. Happy graduation day, my little love.